COOKING SERVICES AND ALL TAXES INCLUDED - NEWLY RE-DECORATED! BEST AMENITIES OF ALL BEACH RENTALS INCLUDING COOKING SERVICE - CHECK US OUT AND COMPARE! We are offering our private beachfront home for rental to a few discriminating guests who want to 'leave it all behind.' Wake up to the soothing sounds of the Caribbean, spend quality time with your significant other or family, and enjoy an array of water sports or just sooth your soul with the sights and sounds of the exquisite turquoise sea. Completely furnished, this three bedroom, three bath, multi-level home has panoramic views from all rooms and palapa terraces. The private beach with pristine location is for snorkeling, scuba diving, kayaking, and swimming. The gourmet kitchen comes complete with marble counter tops and culinary cookware. The dining area includes a spectacular granite table for fine dining. Both the romantic front palapa and ocean side palapa are available for dining. All three bedrooms are air-conditioned. All beds are Sealy Posturpedic mattresses with all cotton sheets. Custom made furniture, draperies, and bedspreads. All bedrooms are furnished with lock boxes large enough to accommodate laptops, large purses, cameras etc. Outdoor palapa dining area and second floor sundeck are ideal for sunbathing or stargazing, enjoy gentle sea breezes, and gaze at the enchanting turquoise waters below. Kayaks, life jackets, and snorkel equipment provided at no charge. Close to numerous recreational activities and excursions. YES - we have stand up paddle boards! Kayaks, satellite TV, DVD, books, telescope in living room, binoculars, life jackets and snorkel equipment provided. COOKING SERVICE - provided Mon. thru Sat. breakfast and dinner with advance notice. Daily maid service provided, on-site caretaker couple and other local assistance provided. Laundry service available at an additional fee. We grew up in small town America midwest and we searched for a beach property that had that same small town ambience. This property is a cozy, whimsical beach house reminiscent of the days before the oversized and ecologically unsound hotels and commercial establishments arrived in Tankah. This home is set up for adults so each couple has their own ensuite bath and lounging areas providing a great blend of privacy and group spaces not found in other homes. We are on a private gravel road in a rural setting. margarita machine, toaster, blender, every amenity! What a great place to unwind! Snorkeling in cenotes just steps away from the house. Staff was fantastic and the food was great too! They are also very accommodating if you need a grocery run. Highly recommend Tankuh Shores! Love Casa Playa Azul! Perfect size and setup for my family of 5. The photos don’t do it justice. The house is very comfortable, well appointed, and perfect for relaxing. The staff is incredible, keeping the house, patio and beachfront immaculate every day. We Enjoyed everything on the house menu and all meals were wonderful, especially the fresh fish. The desserts are great, too. The kayaks, paddle boards and beach toys were used daily and a blast to surf the waves in the kayaks. My kids had a great time. The owners are not exaggerating, their stretch of beach is the best in the bay. Thank you for sharing your beautiful property! This past week my wife and I spent a wonderful and adventurous vacation at Casa Playa Azul. We came down to Tankah Shores with a group of.11 Minnesotans leaving the below zero weather to arrive at a shangri la that allows the stresses from busy lives to ooze away into the clear blue water and tranquil sounds of the ocean lapping on the shore. We shared the Casa with another couple and the rest of the group stayed next door at Casa Soleada. The entire week was a planned vacation of mixing cooking Mayan dinners along with friends and acquaintences. 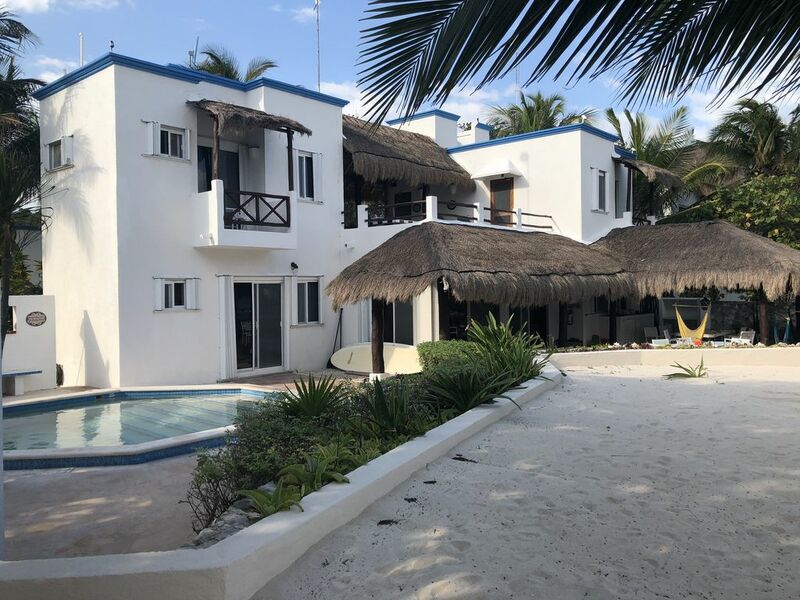 Our Casa had the spacious and comfortable amenities with separate rooms to accommodate 3 couples or a family, with large king size beds, private showers, and windows opening to the ocean letting in the soft breezes. As you walked up the path from the road there was an aviary with colorful tropical birds native to the area. Palapas over the front and back roofs gave it the warmth of the carribean. The two upstairs rooms had small balconies where one could share morning coffee with their partner watching the sun slowly rise into the blue sky dotted with puffs of clouds. We really liked the outdoor patio separating the two rooms with lounge chairs and a table for sharing. The downstairs room opened into a spacious patio that overlooked the ocean where one could open the sliding glass doors and slip in for a cool dip in the pool. The patio was the center for conversation where we could sit and watch what we called our infinity ocean with a short wall which kept the sand from blowing into the space, providing some privacy, and made the ocean seem like it was flowing right up against the wall even though it was a short distance away. We relaxed by the pool or on the lounge chairs on the big sandy beach. We also had wifi for connecting back home. One of the biggest pluses of the accommodation was the warm and friendly staff who made sure that your needs were met. For those wanting a carefree holiday you can pick from a menu, plan out the week and have Edith or Odalis cook breakfast and dinner for six of the seven days. By the end of the week we were relaxed and ready to come back again. We would definitely recommend Casa Playa Azul! We had an amazing stay at Casa Playa Azul. From the caretakers to the house you cannot go wrong booking this house for an amazing stay in Tulum. The caretakers provided dinner our first night and it was delicious they also surprised us with banana bread one day. They were extremely thoughtful and very meticulous. As most of you are aware their is seaweed washing up all over the beaches. No matter where we went it was an issue, but at Casa Playa Azul the beaches are swept every other day and the beach was beautiful. Maya the rental puppy was so cute and she often came over for a little snack. The cenote across the street is beautiful and definitely should not be missed. I cannot say enough nice things about our recent stay. My overall impression of this property is that the staff maintains it extremely well. This property is beautiful, waking up with the view of the ocean is the best way to start any day. Thank you! Our staff are excellent! this was our 3rd time staying, we just absolutely love this place. Its our home away from home. everything is perfect! the caretakers are awesome we just love all of them,they do such an amazing job taking care of the house and the grounds. the food is always amazing, the chicken Mole` is my favorite by far. we already have a stay booked for May 2019. I am not one to write lengthy reviews. If you are looking for a nice house on the beach with that home feel then this is your place.